On Saturday 1st December 2018, our family received the devastating news that Sophie had been involved in a terrible accident and was currently being rushed to hospital, with no feeling anywhere in her body. As many of you will be aware, Sophie had been living a life-long dream by travelling, but had only been in Thailand for a week before we received this news. My Mum and Dad immediately flew to Thailand to be by Sophie's side, as she went into theatre for major surgery. Prior to this, the news was broken to us that Sophie had broken her neck at C6 and C7, which had left the spinal chord compressed. This means that we are currently left in a situation where we are unsure, at this stage, as to whether Sophie will be able to walk again. On arrival John and Jane were informed that Sophie was lucky to be alive, as it was 'touch and go' at one stage, as to whether she was going to live, due to her blood pressure dropping to dangerously low levels. 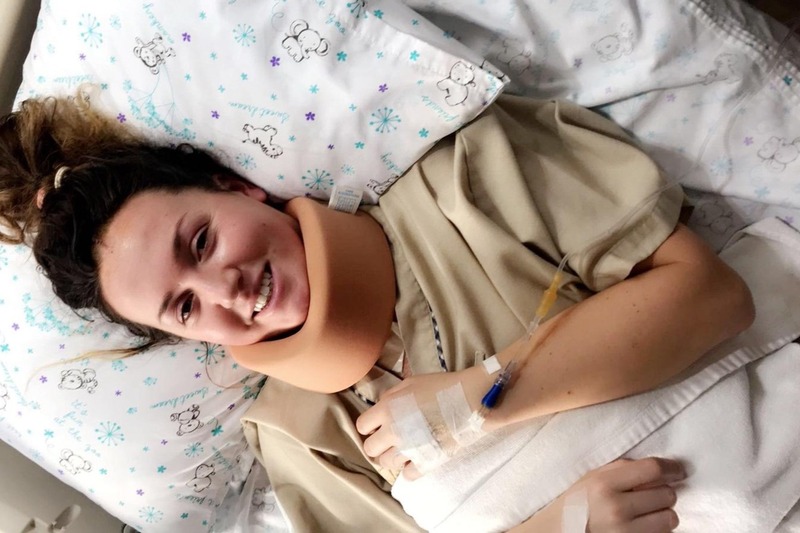 Sophie has since undergone 10 hours of surgery in Thailand, both of which were successful and have gone on to maximise her chances of recovery. Over recent days, with the support of the amazing medical staff in Thailand, we have witnessed Sophie's progress, as she is now able to move one arm and the pain is slowly beginning to ease. Of course, we are aware that Sophie's recovery is going to be a long and challenging battle, through which there are sure to be ups and downs. Our cause has not been supported by insurance companies as they have informed us they will not be covering the costs of the operations, any care she needs from this point onwards or most importantly to us, getting her home to the UK. Consequently, this has left our family faced with the prospect of paying for such fees, which so far stand at no less than £36,000, not including the cost of bringing Sophie home. Sophie is one of the bravest women you could ever wish to meet and she is our little miracle. Our wish now is to get her home as soon as is physically possible, so that she can begin her rehabilitation programme to support the recovery process and be re-united with her loving family, after what has been the most challenging time of our lives. All donations, no matter how big or small, would be hugely appreciated, as Sophie begins this long journey with everyone's support.